Every month at Incandescent.Scentsy.us, a New Warmer and Fragrance is introduced at a special price of 10% off. It’s always an exciting time and our customers get excited to see what’s new! 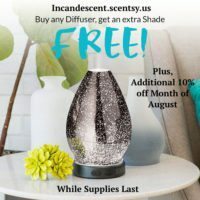 The Scentsy Warmer & Scent of the Month specials are limited and are subject to selling out, so our customers want to find out and pre-order them as soon as they can. Each month a unique warmer is chosen and a corresponding fragrance. We have some of our most popular warmers come out with these specials, and at times, they may return after a sell out to our standard catalog(if we are lucky – i.e. Chasing Fireflies Warmer and Road Less Traveled Warmer). The same goes for fragrances. Scentsy Scent of the Month Fragrances are available in the following forms: Scentsy Bars, Scentsy Room Sprays, and Scent Circles. If a warmer and/or fragrance doesn’t sell out in its’ introductory month, it will remain (while available) thereafter to purchase on our website for six months(at regular retail price). Everyone always asks when they can find out the about the Next Special: On the 1st of the month, at Incandescentwaxmelts.com, we will show you a preview of what’s coming the following month. It’s one of our biggest requests. And often times, if a customer loves what they see coming, they like to pre-order to ensure their order is placed right away. Pre-orders are taken by contacting me directly either by phone or email request. Want to see the current monthly special?